Noble absolutely loves the Salt Lake Temple. About 6 months ago we were in Deseret Book and Noble stopped infront of a beautiful picture of the Salt Lake Temple and just stared at it for a second and then shouted, "My Temple!". Whenever we leave the "Tower" we have to drive past the temple. Last night we went and took pictures at temple square of the kids. This is so their personalities, I LOVE IT! So cute!!! 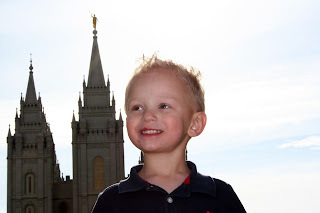 I love those pictures and I love that they love the temple! Someone has taught them well! I'm pretty sure Olivia and Noble are destined to marry each other. I can't wait to see these kids in person again! !